Rajeev's World: Do 50,000 jobs today, matter? During his visit to India, President Obama behaved like a super smart, manipulative college lass who uses the boys who swoon over her to her advantage, get them to do her homework, assignments, etc. 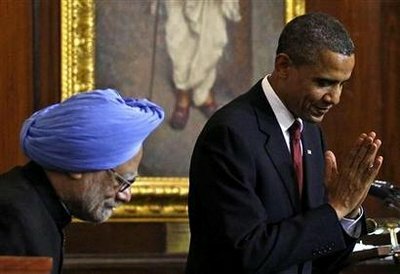 It is indeed true that Manmohan Singh swoons over America. Indians do admire the United States. So his speech in the Central Hall of Parliament which was liberally peppered with references to our mythology, freedom struggle, Gandhi, Ambedkar, Chandni Chowk and a lot more was meant to sound like music to Indian ears. The references to India's emergence as a great power were tailor-made to sweet talk India into doling out business deals. That seems to have worked very well for Obama. Besides the deals signed by SpiceJet and Reliance Power, the press had been receiving selective leaks suggesting that POTUS' sales trip was immensely successful. A blog on Indian defence, LiveFist, authored by a well-informed defence journalist, Shiv Aroor, recently reported that the Indian Air Force is buying an additional six C130J Super Hercules transport aircraft. Instead of the publicly announced order for 10 C-17 Globemaster III aircraft, the Indian Air Force may just end up ordering 17. Similarly, the Indian Navy could order a few more Boeing P-8I Poseidon maritime reconnaissance aircraft. The bottomline is that we have gifted the United States over 50,000 jobs. The salesman-in-chief, POTUS, would now expect a reasonable bonus, read: a re-election! But 50,000 jobs do not matter for India, neither do 100,000 jobs, or for that matter 1,000,000 jobs. What matters is whether we are able to extract the right leverage from the United States. It is certainly true that Obama's long-winded sales spiel in Parliament does not mean anything for India. We do not need his stamp of approval to get into the United Nations Security Council. We cannot rely on the United States to solve our regional security issues, afterall the United States is no headmaster to punish an errant Pakistan. It's our job to teach the Pakistanis a lesson. How we would get the right leverage in the United States is clear. The United States has been asking Indian corporates for investment, which was explicit in the recent visit of President Obama. It would not matter much for India if Mr. Ratan Tata would get Jaguar Land Rover to set up a plant in Detroit or Mr. Mukesh Ambani setting up a refinery on the Gulf of Mexico. Increased corporate investments would lead to increased transfer of technology and know how. That also has an unintended but useful consequence in the form of penetration of lobbies in Washington. Undoubtedly lobbies help, Israel has shown that well. That is the leverage we need - the ability to influence policy when so desired. That should be the strategic objective. That means we are in it for the long haul. So 50,000 or 100,000 or even 1,000,000 jobs do not, do not matter at all in the immediate future.